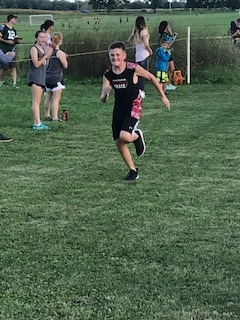 My son is on the cross-country team. It is my favorite sport of all the things I’ve sat on the sidelines watching. You watch hundreds of kids head out to try to beat themselves. They go through the woods. You catch glimpses of them at times and then they are gone until they appear again over some hill or around a bend. Some of them puke. Some smile the whole time. Some are out in front and never see the back of anyone’s head. Watching them makes me feel like I can run. Like anything is possible. Like the whole world is ahead and I can be a champion, and then I realize I’m out of breath from just trying to catch a glimpse of my son barreling through the forest. I can never think of anything profound enough to scream from the sideline to inspire him to greatness. I’m not sure if he hears me, or even sees me when he’s running. But when I see him run, it makes me cry. It’s like this amazing metaphor is coming to life. Like this profound moment is happening every time. There he is running his hardest. Trying his best from the middle of the pack; just to beat himself. Every time he’s the underdog. He’s in the woods. He’s back out of the woods and now there’s a hill. I can’t help him. He can’t hear me. He can’t see me, but I’m always there out of breath, cheering him on from any place I can find a good view of him staring ahead and running toward the finish line. Run like an underdog. You’re not there yet. It’s a long race and it’s you versus you. Run. Run with all your might. Get up the hill. Get out of the woods. Life is time. Use your heart. Stay out of your head. Leave it all out there. Let your soul get drenched in sweat. Let your breath be taken away, again, and, again, and again. Run you amazing kid. I’m watching. I’m cheering and I’ll catch up with you at the end.